Update on November 20, 2014: The School Board received an update on LCAP implementation at the November 19th meeting. The presentation is available here in PDF. Update on October 22, 2014: Berkeley’s Local Control and Accountability Plan was approved by Alameda County Office of Education in August, 2014. The links above include the final approved version of the LCAP for 2014-17, as well as a few of the individual components of the plan. Superintendent responses to public comments and questions from the PAC/DELAC and general public will be available on the district website on Monday, June 9th. You can find the link here. Next Steps: Based on feedback from the Board, from the PAC and DELAC, and from the public, a second draft of the LCAP is scheduled for presentation at the May 21st Board Meeting. The formal public hearing on the final draft of the LCAP and the district’s 2014-15 budget will occur at the June 11 board meeting. The final LCAP will be presented to the board for consideration at the June 25 board meeting. One of the key components outlined in the Education Code is that districts must consult various stakeholders in the development of the LCAP, and allow them to review it and comment on it. 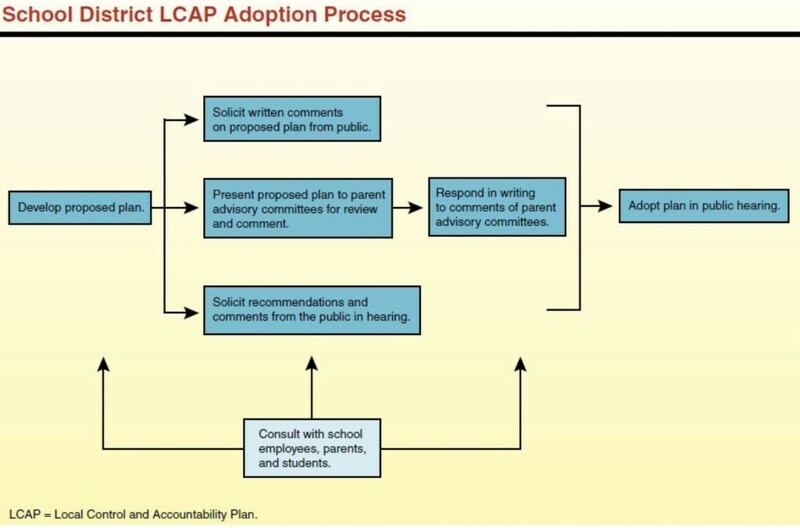 The figure below outlines the process a district must follow in adopting its LCAP. One of the main procedural requirements is that a district consults with its school employees, local bargaining units, parents, and students. As part of this consultation process, BUSD must present their proposed plans to a parent advisory committee and a separate EL parent advisory committee (DELAC). The advisory committees can review and comment on the proposed plan. Ed. Code also requires districts to respond in writing to the comments of the advisory committees and to notify members of the public that they may submit written comments regarding the specific actions and expenditures proposed in the LCAP. Please review information on the LCAP advisory committees webpage. The Legislative Analyst’s Office has compiled some helpful information about what the new laws surrounding LCFF and Education Code require of school districts.